The United States of America is a great country founded upon the belief of freedom. Politics have never been my strong point, as a matter of fact, I struggled severely in high school with the subject. It wasn’t until my adult years that I began to see the value in understanding how the political system works. It wasn’t by choice, instead, it was a necessity. Most of us don’t give much thought to something once it has been discarded in a trash can. So where does all that you “throw away” end up? Most of it goes to the landfill, but sadly not all of it. While some people have no issue littering, many people do make an effort to keep our environment clean. However, garbage does find its way into nature, and eventually our oceans. Plastic is the most pervasive due to its slow biodegradability. Although some plastics have been found to biodegrade quickly through photodegradation, resulting in the release of toxic chemicals into the water. These are my amazing and inspirational parents, between them is Grandmaster John Pellegrini. He is our Tae Kwon Do and Combat Hapkido Grandmaster and the founder of the ICHF. 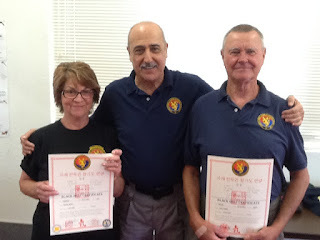 (International Combat Hapkido Federation) They were both recently presented with major achievements; my dad, a Lifetime Achievement Award and his 8th degree in Combat Hapkido and Tae Kwon Do, and my mom her 1st degree in Combat Hapkido. My mom is also a 3rd-degree black belt in Tae Kwon Do. This was a well-earned recognition for the both of them, only achieved through many years of perseverance, commitment, and dedication. So did I catch your attention or just piss you off? Good….keep reading. When we assume things we miss out on a lot of the in between. Judgments-we all make them.